When September draws to an end and colorful autumn knocks on the door, the All Nations Cup brings magic to the town and unfolds its own magic and fascination in Aachen. It is a tribute to the elegant and ethereal Arabian horse and its breeders’ passion. It was one of those special moments when British tenor Paul Potts performed the famous aria from the final act of Giacomo Puccini’s opera Turandot - Nessun Dorma - on Sunday afternoon; Italian for “none shall sleep”. Well, the All Nations Cup Festival is a show where nobody seems to sleep, even after four exciting days. Arabian horse lovers around the globe remember fantastic and unique Aachen moments. 2017 All Nations Cup Festival offered some more of those moments and no one dared to sleep to avoid miss anything! Here are some of the authors very personal Aachen moments. The junior classes were strong and competitive, still, some were particularly striking. One was definitely HL El Ganador, who garnered ANC Gold Champion Yearling Colt for his proud owner Nayla Hayek. Probably a premiere, I cannot remember another Chile bred horse winning at the All Nations Cup before. Another one was the divine SMA Magic One daughter Mozn Albidayer, 2016 U.S. National Champion Junior Mare, bred and owned by Albidayer Stud, UAE. The judges laid the 2017 ANC Gold Champion Junior Filly at her delicate feet. It was spectacular, when 2015 Tripple Crown winner AJ Azzam, bred and owned by Ajman Stud, UAE, returned into Aachen as a powerful three years old colt garnering ANC Silver Champion Junior Colt. Bested only by Alexxanderr, a Shanghai EA son owned by Al Sayed Stud, KSA. The dainty fleabitten Anood Al Nasser, proudly bred and owned by Al Nasser Stud, QAT, wowed the audience and judges likewise. The Ashhal Al Rayyan daughter received the highest points of all Senior mares and pranced away with ANC Gold Champion Senior Mare. Another show stopper was Shanghai EA son Excalibur EA, bred by Albert Sorocca and owned by Al Saqran Stud, UAE. 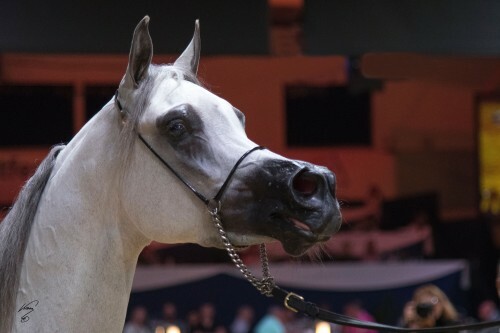 This highly elegant glistening white Excalibur EA became Highest Point and Best Movement Winner and achieved on top ANC Gold Champion Senior Stallion with the remarkable bay stallions Emerald J and Morion garnering Silver and Bronze. Talking about bay stallions: While I enjoyed a brief break from the electrifying atmosphere in the arena a dark bay stallion passed by. The forehead crowned by a small star, the delicate ears pricked watching everything attentively while he arched his wonderful neck. 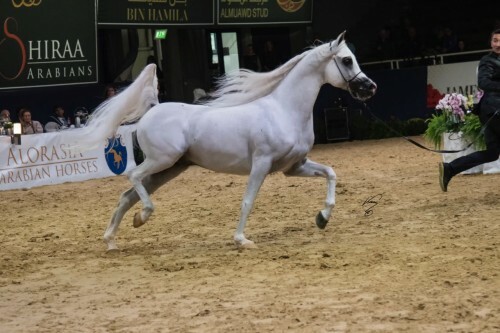 It was the incomparable Gazal Al Shaqab! Maybe he recalled the time when he garnered his rosettes at this place? This time the 22 years old stallion returned to accept graciously his Lifetime Achievement Award. Another Lifetime Award was awarded posthumously to Ignacy Jaworowsky (1924 - 2004), the unforgotten director of Polish state stud Michalow. It was thanks to him that the name Michalow became a brand and gained worldwide fame. The obviously moved audience carefully listened to the laureates Dorota Janiszewska and Agnieszka Rozwadowska, Ignacy Jaworowsky daughters, who expressed not only their gratitude but also criticized the present Polish government and its policy. The Arabian horse scene does not just celebrate itself. The charity has found its place during the All Nations Cup Festival. 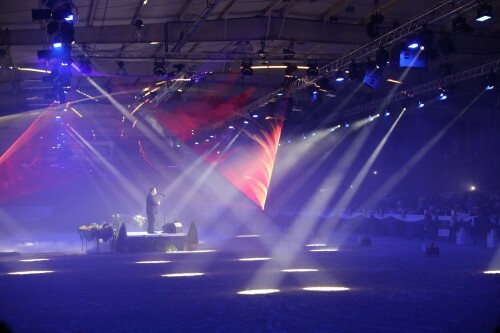 During the European Breeders Trust and ANC Festival Charity Gala more than 185.000 Euro were spent for local charity projects; cordial thanks go to generous Dubai Arabian Horse Stud for making this possible. During Sunday afternoon another global player of Arabian horse scene opened up the possibility of doing something good. 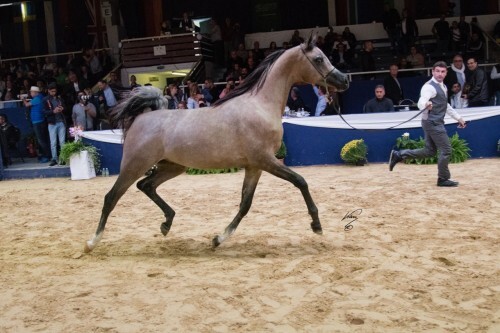 Al Shaqab donated a breeding to world-famous Marwan Al Shaqab and De Catherey Arabians, France, bought it at the auction for 30.000 Euro. Of course, there were so much more wonderful moments. Just in case you missed one of it, enjoy the replay of our live stream, full results and lots of photos. Heartfelt thanks go to the breeders, owners, trainers, handlers, and fans of Arabian horses and to all the generous sponsors who made this All Nations Cup Festival possible. We wish to thank the All Nations Cup organizers and the photographer Jan Kan for partnering with Arabian Horse Results.